Larson Electronics has announced the release of a 600 watt skid mount five stage electric light mast with a manual crank cord reel. This tower features a rotating boom that allows for 360° of rotation, a removable mast head, and a cube frame with skid pockets with 4-corner pick eyes for easy transportation. The LM-30-8-5S-4X150RT-LED-EW-SM telescoping steel light mast from Larson Electronics is designed to quickly and safely deploy 600 watts of intense LED lighting in locations where elevated illumination is needed. This mast is equipped with four 150 watt LED lamps that produce a wide spread of intense white light, allowing this unit to effectively cover large work areas with high quality illumination. This light boom can be extended to 30’ for maximum area coverage, collapsed to 8.83’ and is constructed of square steel tubing in different dimensions for each section. The mast is elevated using an included 3,500 lbs. electric winch with 3/16” galvanized braided cable. 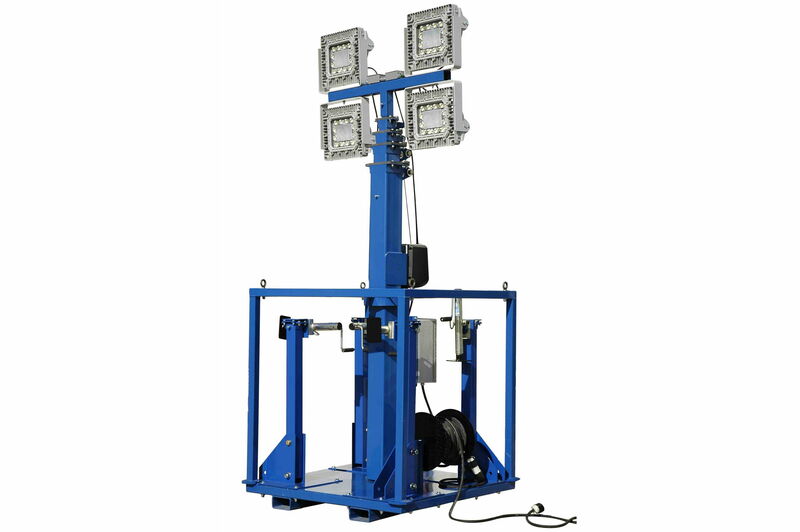 The light heads on this tower are wet area suitable high output LED fixtures that produce a combined total of approximately 50,000 lumens at 600 watts. A 44” wide and 2” by 2” by ¼” thick mounting plate is attached to the upper section of the mast which provides a strong and stable platform for the four LED fixtures. The mast is bolted onto a 1/8” thick carbon steel plate via six 1/3” anchor bolts. The mast and controls are secured within a cube-style frame constructed of 2” by 2” by 1/8” thick and measuring 48” wide by 48” long by 53” tall. Eight skid pockets allow this unit to be picked up from all four sides, and four-corner eyelets allow for stable deployment via crane operation. The mast is operated via push button switches within the cube frame, allowing operators to raise or lower the mast with the push of a button. Four 4’ slide out outriggers with 1,200 lbs. manual crank leveling jacks allow operators to anchor the unit down, providing stability during deployment. Power is provided by 200’ 14/3 SOOW cable within a manual roll up cord reel and terminated in a 20 amp 5-20 straight blade plug. he thirty-foot tower and assembly is powder coated with a glossy blue finish for corrosion resistance and aesthetics.